26 June 1940. This is an commemorative the second visit of the Emperor Kang-teh to Japan. The purpose of the visit was to celebrate with Emperor Hirohito the 2600th anniversary of the Founding of Japan. 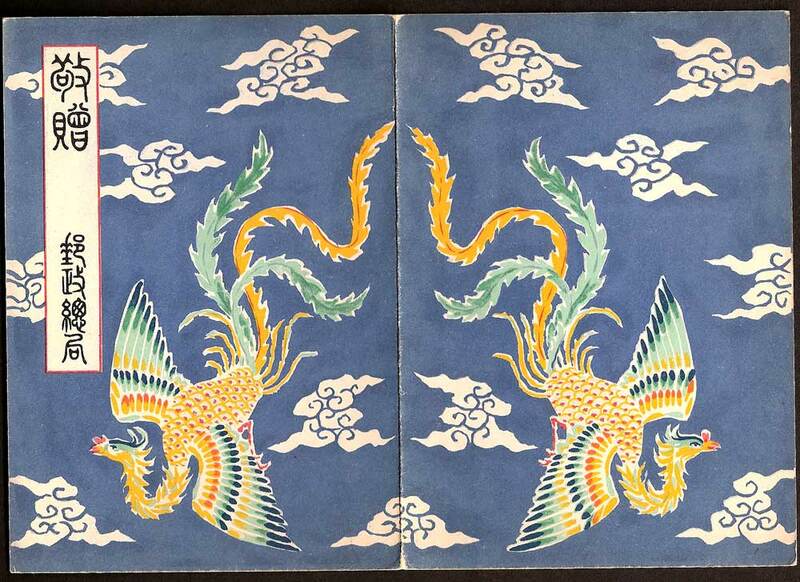 In 1935, on his first visit to Japan, the Emperor Kang-teh travelled in the battle-cruiser 比叡 "Hiei" (formerly the Emperor Hirohito's Flagship and named after 比叡山 Hieizan, a mountain in Kyoto) and the vessel was followed by two cranes. This was seen as a very good omen by the Japanese and signified great happiness. 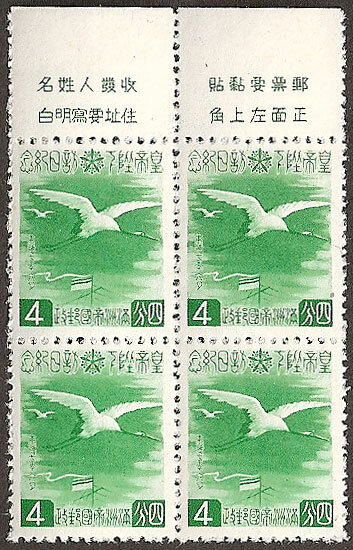 The Japanese artist Yoai Ota produced an oil painting to mark the event and the stamps are based upon a detail from this picture featuring the two cranes flying above the mast. The second visit to Japan in 1940 was aboard battleship日向 Hyūga. Hyūga, was the name of an old province in Kyūshū. 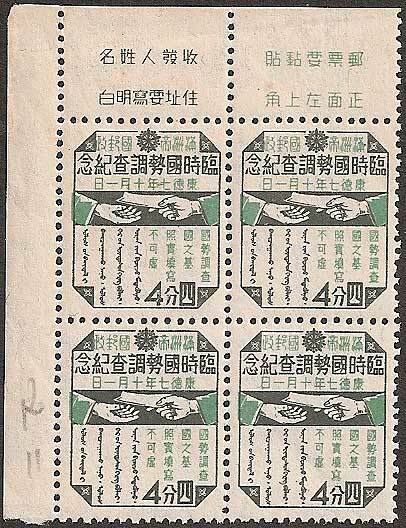 The stamps were photogravure printed on un-watermarked white paper in sheets of 100 by the Japanese Government Printing Office, Tokyo. A presentation booklet exists for this issue (see below). 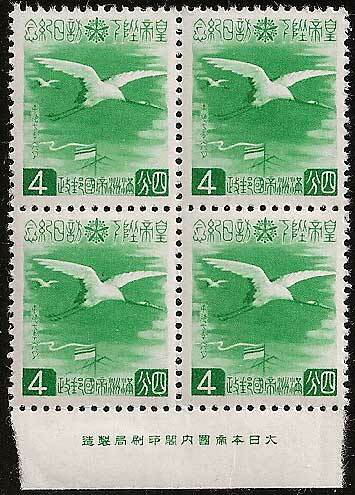 Any "specimen" stamps or sheets you may see for this issue are fakes. 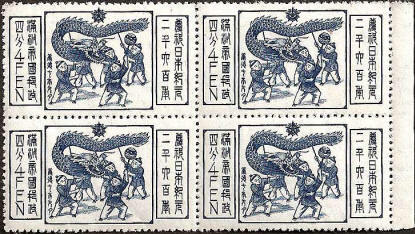 Two Values 2f and 4f, both feature a Manchurian Crane flying above the mast of the cruiser with Chinese and Japanese characters. 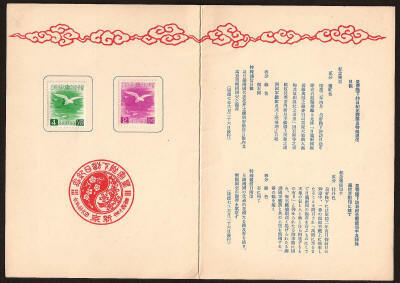 The slogans on the top margin as shown below read "Place the stamp in the top left corner of the envelope" and "Write clearly the names of the sender and recipient". 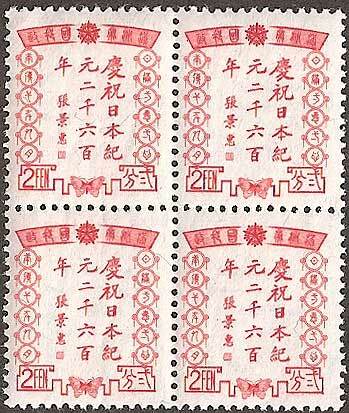 Block of 4 showing the 12 character imprint at the centre of the bottom margin which reads Printed by the Great Nippon Empire Cabinet Printing Bureau. Type A. 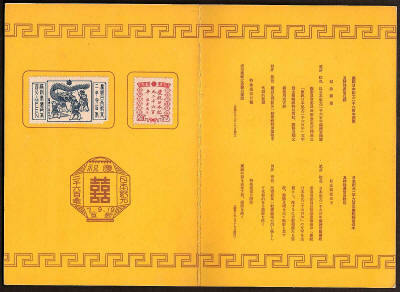 Presentation Folder - The Yin/Yang design shown below the stamps was used as the official commemorative postmark (Zirkle 50). 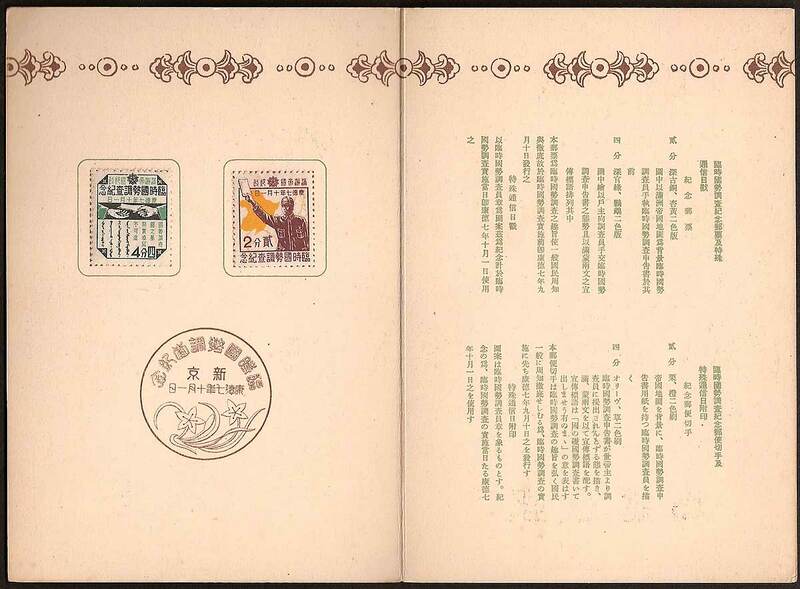 The text explains that the stamps are to commemorate the second visit of the Emperor Kang-Teh to Japan in both Chinese (top) and Japanese (bottom) characters. The cover has a stylized Phoenix design. Zirkle 50 - Issued 26th to 28th June 1940. 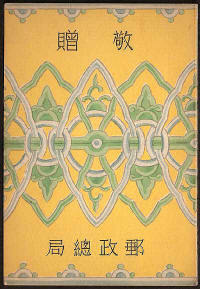 This example was issued in 新京 Hsinking. 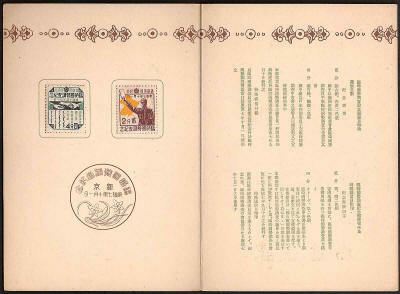 The text explains that the stamps are to commemorate the second visit of the Emperor Kang-Teh to Japan in both Chinese (top) and Japanese (bottom) characters. Not a very successful cancel in that it often appears blurry and indistinct. 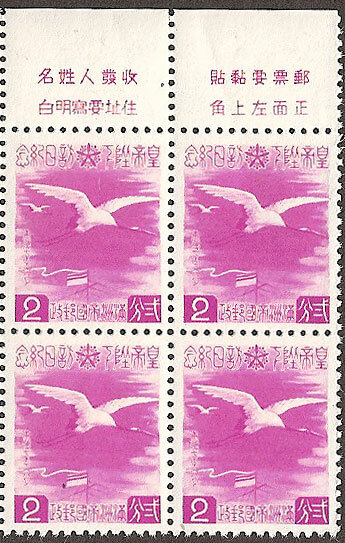 Good copies are hard to find, possibly due to the reddish brown ink which is most commonly used and was probably issued with the chop. 10 September 1940. 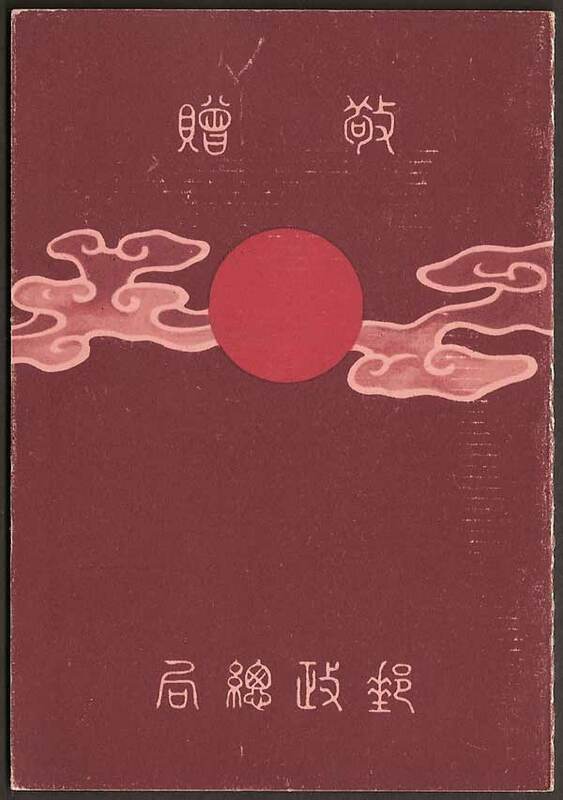 This is an issue to advertise the first national census of the population of Manchukuo, this took place on 1st October 1940 and put the total population of Manchukuo at 43,233,954. The message on the 4f stamp read "The census is the basis of the country, give honest and accurate information". You will see that information was used later for conscription (1941) and also to draft war workers into factories as a result of a new Labour Service Law (1943). 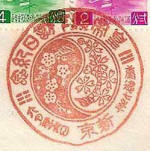 Both feature on later stamps. 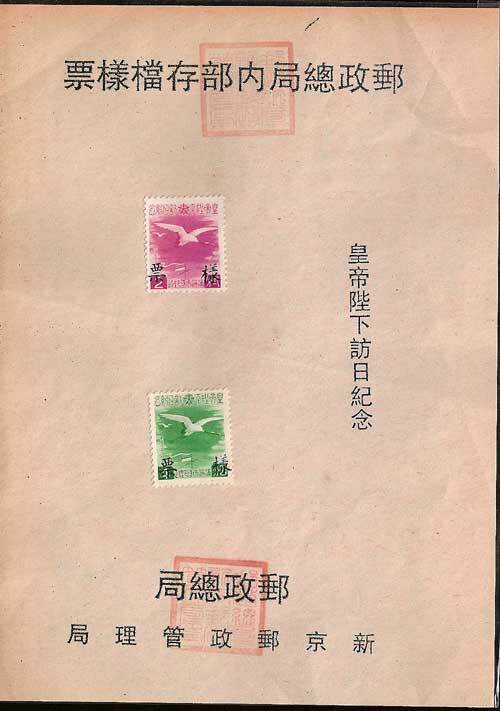 The stamps were lithograph printed on watermarked (see below) "granite" paper in sheets of 100 by the Manchukuo Postal Administration Office. A presentation booklet exists for this issue (see below). 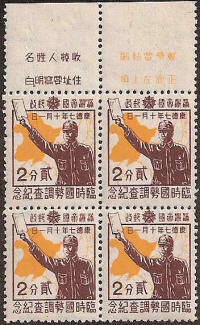 Any "specimen" stamps or sheets you may see for this issue are fakes. Hsinking. Designs by Mr Yoai Ota. 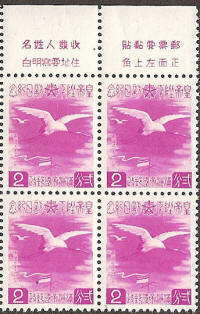 The stamps are 18.5mm x 23mm. Perf 13. x 13½. 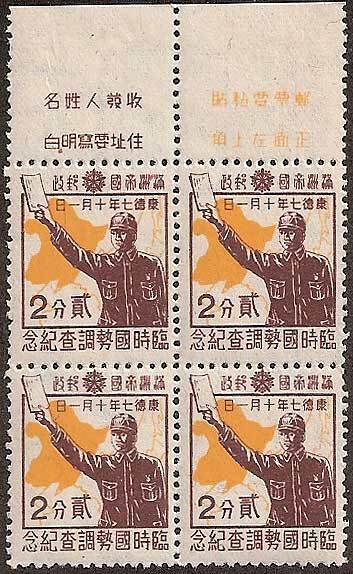 Two Values 2f and 4f, The 2f features a Census official with a map of Manchukuo in the background, the 4f shows census slogans in Chinese and Mongolian characters. Cover and Contents of Special Presentation Booklet. 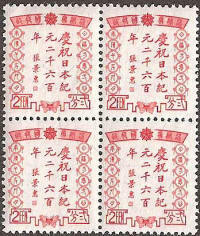 The special cancellation shown below the stamps shows the two character Hsinking postmark. The Hsinking postmark was used in all Presentation Booklets. Zirkle 53 - Issued 1st October 1940. This example was issued in 哈爾濱 Harbin. 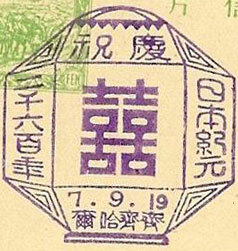 This cancel is connected with the National Census, the design being based upon the emblem used upon the uniforms of the census takers. The census stamp issue came into use three weeks before the census was conducted, the cancel was only used upon the exact day of the census. 19 September 1940. This issue commemorates the 2600th Anniversary of the Japanese Empire, celebrations had been going on all year and included a visit by the Emperor Kang-teh to Japan. 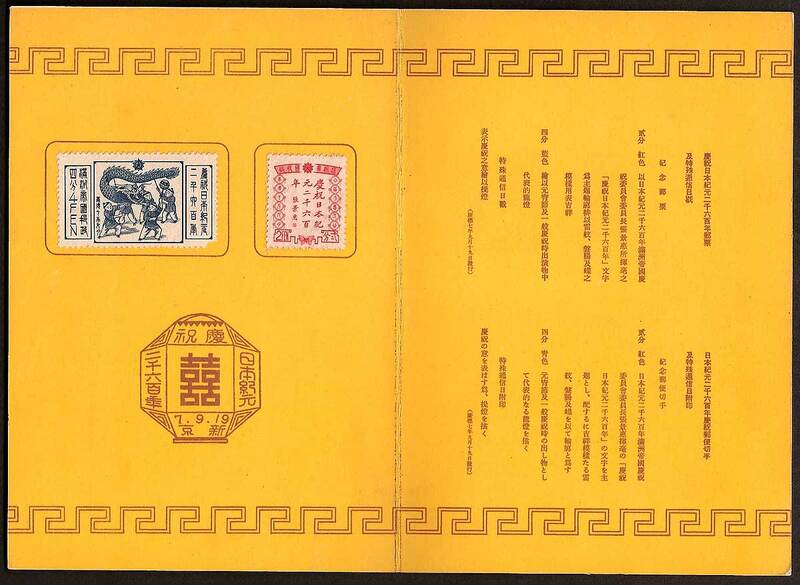 A commemorative cancel and presentation booklet exists for this issue (see below) and a special set of six picture postcards appeared for sale though Post Offices, these can be seen here. The intended date of this issue was 18th September and this is significant as it was the ninth anniversary of the famous Mukden Incident. The release was delayed by one day because this date clashed with the funeral of the Imperial Prince Nagahisa who had recently been killed in a air crash in Mongolia. (Note - see if you can find a copy of this stamp with the postmark dating 18th September 1940, it may be that it was not possible to get a message to all Post Offices saying that the distribution was to be held up by one day - email if you find one). 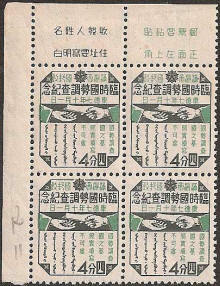 The stamps were engraved in Japan and recess printed on watermarked (see below) "granite" paper by the Manchukuo Government Printing Bureau, Hsinking. Sheets of 100 for the 2f and 50 for the 4f. A presentation booklet exists for this issue (see below). I have seen an imperf block of the 4f offered at auction and can only assume this is a proof; these are not mentioned by any authors on the subject that I am aware of. 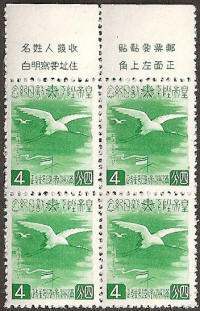 Any "specimen" stamps or sheets you may see for this issue are fakes. 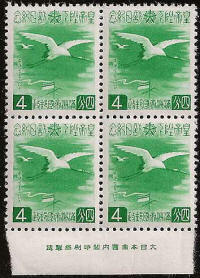 Cancelled to Order stamps have also been found for this issue and these can be seen here. They are thought to be an unauthorised issue, possibly the result of a dealer bribing a postal worker. There are no slogans or imprints associated with this issue. 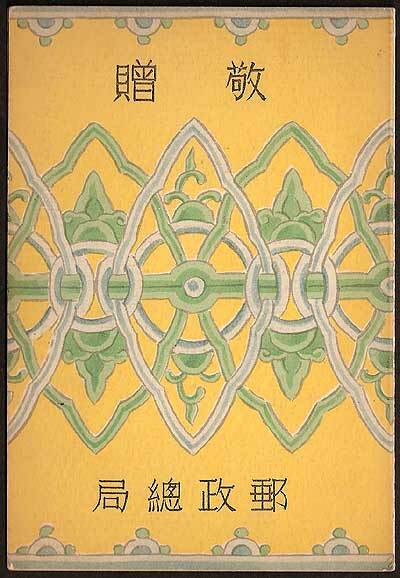 Design of 2f by Mr Yoai Ota, - 4f by Mr Lee Pai Ho (a Manchurian designer). The 2f is 17.5mm x 22mm Perf 13 x 13½, - The 4f is 40mm x 23mm Perf 13½ x 13. 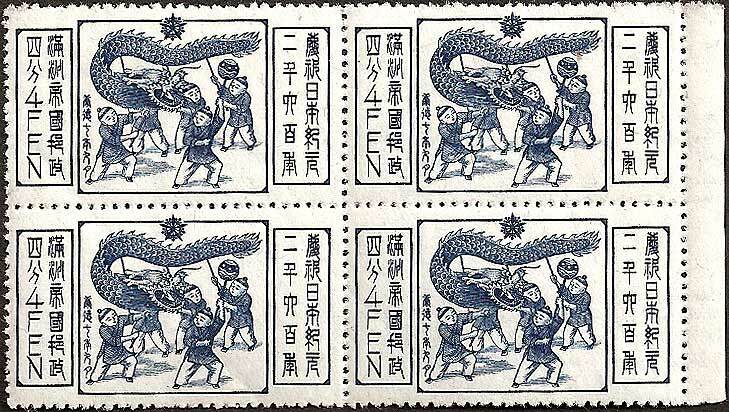 Two Values 2f and 4f, The 2f features a Characters written by Chang Ching-hui (Zhang Jinghui) the Prime Minister of Manchukuo, reading "In celebration of the 2600th Anniversary of the Founding of Japan" (the butterfly is his seal), the 4f shows Dragon Dancers, in the left box "Manchu Empire Postal Administration 4 fen" in the right box characters that read "2600th Anniversary of the Founding of Japan" . Zirkle 52 - Issued 19th to 20th September 1940. Top Center, 庆祝 (Celebrate), Left, 二(Two)千(Thousand)六(Six)百(Hundred)年(Year) Center 喜喜(Double Happiness) Right 日本(Japan) 纪元 (era). This cancel shows a Chinese lantern which contains the character "Hsi" meaning happiness. 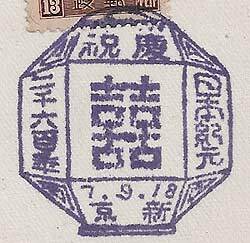 This postmark was originally intended for use on 18th September but delayed by one day because this clashed with the funeral of the Imperial Prince Nagahisa who had been killed in a air crash in Mongolia. Zirkle 52 - Showing 18th September 1940. 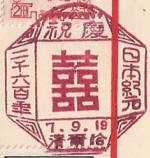 A close inspection of the date-stamps of the cancel show that they have been altered, some more crudely than others although unaltered copies do occur. Both Zirkle and Akagi show images dated 18th September, these were probably taken from official press releases advertising this issue. 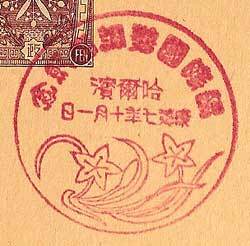 Sadly the example shown above is one of a number of fake cancels sold by a Japanese stamp dealer in 2011.